What do radar guns, GPS and the Internet have in common? They were all heavily developed by the US military before they were accessible for public consumption. The military has had a large hand in numerous innovations over the years and one recent project will be a boon to the motorcycle community � if you like to ride warm. Beginning in 2006, Gerbing's Heated Clothing was contracted by the US military to develop the next level in heated clothing technology. The company had been on the forefront of heated clothing since the 1970s when founder Gordon Gerbing first laced the interior of a snowmobile suit with copper wire, making it warm up similar to the way electric blankets work. That same copper wire technology held steady throughout the company's development of heated gear until now. Anyone who has donned a heated jacket, gloves, pants or socks from any manufacturer knows the issue with copper wire is that it's bulky and feels strange around the fingers when you're trying to operate your motorcycle. The company was charged with developing a heating technology that shed the bulk and odd feeling of the old copper wire format. A Kevlar heat transfer technology had been developed by another company to a point already, but the project was scrapped when the Kevlar proved to be inconsistent in temperature range and faulty in the field. Gerbing's went on a mission to find a better way. In the process they came up with not one, but two new technologies. The first technology to be developed was branded as Microwire. 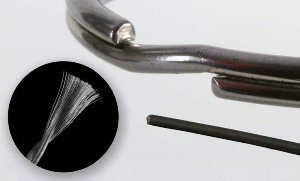 It involves creating small wires, about a quarter of the size of copper wire, by bringing together several hundred strands of conductive wire which are a quarter the density of human hair. Wrapping these in pairs and running them alongside each other creates a flat surface area like ribbon in which the heat can be transfer to the rider without the bulk of the old technology. In 2008, Gerbing's quietly phased this into their current line of Classic and G3 gloves and incorporated it into a new glove, the T5. It worked well and managed to provide the same level of heat as the old technology at about the same wattage. Later in 2008, Gerbing's replaced their line of heated socks with heated insoles which utilize the Microwire technology. The ribbons of microwire are very suitable for gear like gloves and insoles, but heating pants and jackets would require a different approach. Above: The black line at the bottom right is Microwire, next to a key ring which represents the thickness of the old copper wire technology. The fuzzy stuff on the left is the Microwire opened up displaying the hundreds of hair-like wires woven in to the wire strand. To accomplish the task of heating jackets and pants, Gerbing's developed a small conductive thread which would come to be known as Nanowire. This thread can be sewn into patterns that would be inserted in the sleeves, chests and backs of their jackets and vests as well as the legs on their pants. Unlike Microwire, the Nanowire can give a broader radiance of heat on larger garments. 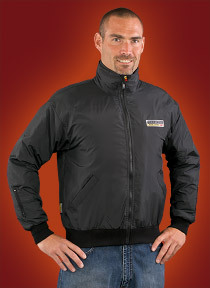 For motorcycle enthusiasts, it would appear that Gerbing's heated clothing was created just for them, and originally it was. There's always been growth at Gerbing's. First it was when they picked up a contract to build all the heated gear for Harley-Davidson at the turn of the century. Later they developed heated pads for sporting events. More recently they have developed a 7 volt rechargeable battery line that can be used by someone working outdoors such as a hunter or camera man, to keep a flow of heat going to the body for a period of time. The need for heat is huge from the pipeline worker in Alaska to the fishing crew on the Arctic Ocean and Gerbing's is at the forefront of creating the gear to keep people working in a myriad of industries. To accommodate all this growth, Gerbing's recently moved from their 7,000 square foot facility in Union, Washington, to a new 29,000 square foot facility in Tumwater. 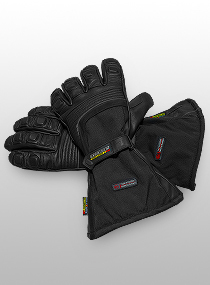 Above: Gerbing's newest glove, the T5 incorporates the companies new, stealth, fast heating microwire technology. The recent developments by Gerbing's that apply to the military also apply to the industrial and medical fields are likely to insure the company will continue to grow in the heated clothing market, despite the current down economy. No more socks! 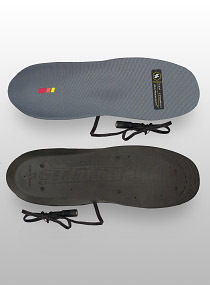 Gerbing has come up a new heated insoles to replace their sock line.